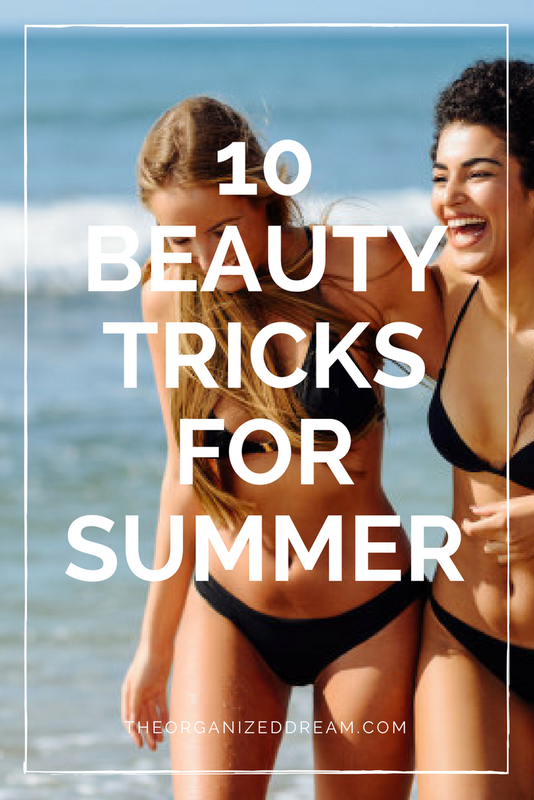 Here are a few beauty tricks to use during the summer. They are great and versatile for everyone including moms who usually only a few minutes to spare when getting ready each day! 1. Colored eyeliner. By simply placing it on your bottom lash line, you instantly look fun and flirty. The best color to try is purple. It compliments every skin and eye color and isn't too dramatic for those who don`t want to go to drastic. 2. Bronze legs. Finding it hard to match the skin tone on your arms to your legs? The skin on your legs is often harder to tan. Trying bronzer on your legs is an easier step than sunless tanner when that just seems like too much work. You can purchase a bronzing dry oil that will give you the glow you want. 3. Big, floppy hats. This is a really great alternative to baseball caps and fedoras. It keeps the sun off your face and you`ll look stylish at the same time. 4. Spritz on summer. It`s okay to admit you don`t care for perfume, especially in the summer. The best alternative is body mists. They add a subtle scent with out overpowering. 5. Sunny nails. Get inspiration from summer like bright blues of the ocean and orange from the sun on short, rounded nails. 6. Chill out your skin. Take a spray bottle filled with water and add a few slices of lemon. Store it in the fridge until you`re ready for an instant refresher. You can also keep your moisturizer in the fridge. 7. Lemon juice your nails. During the summer, we often eat a lot of foods with our hands and end up with discolored nails. Gross! By soaking your nails in lemon juice, those yellow mustard and BBQ sauce stains are easily removed. 8. Glossed Lips. Don't want to wear heavy lipstick or even clumpy, gloopy gloss? Go for the light-weight approach. Baby Lips and other glossy chapsticks is a great alternative when you still want that extra bit of shine. 9. Egg-cellent feet. Often our heels get so dry and chapped from the summer heat from all of those fabulous sandals we love. The Ped-Egg is a great product to use daily or every-other-day to remove dry skin and smooth those heels. Apply a moisturizing foot lotion at night before bed for extra soft feet everyday. 10. Window frames. Large framed sunglasses are an excellent way to protect your eyes from the sun's harmful rays. They cover a larger area of your face and prevent those "side glares" we often get with smaller frames. Thanks for joining me today and don't forget to follow me!